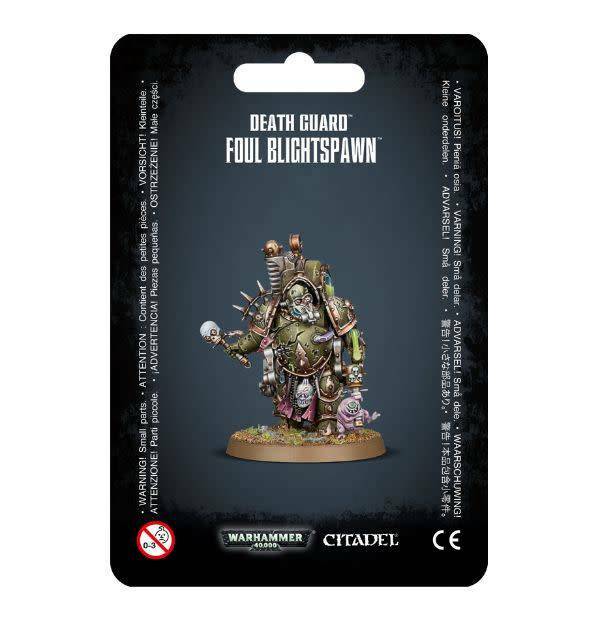 A revolting stench wafts around the Foul Blightspawn, his corruption clotting the air itself. Breath rattles through pus-slick tubes as he cranks the rusted handle of his malignant churn, bellows wheezing and plague slop roiling in the incubatum upon his back. Some foes stare in bewilderment at this strange performance. Some direct their fire at the Blightspawn, shots rebounding from his armour ot thumping harmlessly through rotten flesh in sprays of effluence. The wise, however, flee for their lives. 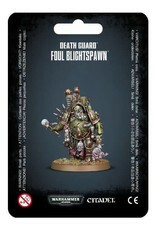 This multi-part plastic kit contains the components necessary to assemble a Foul Blightspawn. He carries an enormous, sinister tank on his back – the incubatum – brimming with foul and noxious disease, which he squirts indiscriminately with malign cheerfulness. His plague sprayer in his left hand drips this vile concoction with no thought for where it may land. A crack in his armour shows the unpleasant extent of his modifications; the gears and pistons of a malignant churn are forcibly driven into his guts. His armour, as well as being covered in rot, features plenty of icons of Nurgle, skulls and rust. There’s even an optional Nurgling clutching a blight grenade to be added to the base.